"I purchased an Alacrity 19 a couple of weeks ago not knowing what it was. There is a convoluted story connected to this event. The short version. I originally was searching for a 26 foot Westerly (twin keels specifically in mind). However, with limited sailing experience I decided to ease my way up from my current AMF Puffer to something a little larger before a substantial (for me) out lay of money. My wife and I could then see if we could handle the motivation, motion and maintenance of a daysailor/weekender. There had been a boat apparently for sale in side yard about 15 miles from our house. Quite a surprise finding it a twin keeler. I contacted the owner and, among other things, asked what model vessel it was. He said that he thought it was a Sterling. Extensive web searching turned up very little on that score. I bought it regardless (against the advice of two sailing acquaintances) . I think the Sterling may have been the make of an outboard motor that is long gone. The fellow I purchased from got it from two others. Each had the intention of refurbishing. That didn't happen so now it is up to me. 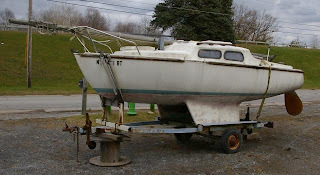 Finally Googled "English twin keel sailboat", found some articles and photos so now I know what I have. I have looked at all 635 posts here and gained invaluable information. I am looking forward to the project and reading about everyone'sadventures posted here. I am located in Upstate New York about 40 miles inland from Henderson Harbor on Lake Ontario. Are there any Viv or Alacrity owners in this neck of the woods?" Any other twin-keeler owners in the area are of course welcome to comment or drop a message in the yahoo groups forum, link to the right.